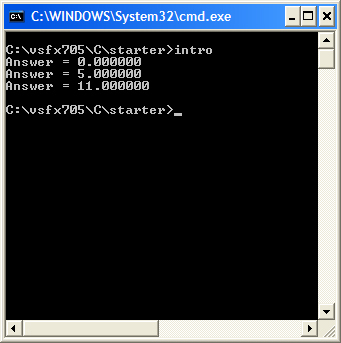 This is a basic script is written to show the use of C procedures(main()) and pointers(*ptr). By executing this script we get a simple return of what is asked to be calculated. The script is run from the command line as to use the .exe that is created when the script is built. The pointer allows us to call to memory addresses that already store information that we might need. This is the start of creating a procedure that will create random spheres within a specified boundary(bounding box). Shown here is an example of how this script works. 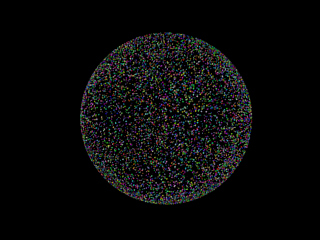 By using "rand()" within the procedure randBetween in the library.c file, we are able to create any number of spheres with a set size within the boundary and add to them random RGB values. This is all utilized in Maya using MtoR and creating a SLIM Ribbox to run the procedure. 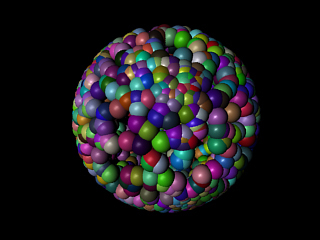 This more detailed script allow us to generate the same type of spheres within a boundary. But this takes it further by adjusting the coordinates of the spheres on the surface of the boundary instead of within the boundary. the "normalize" procedure allow this to happen. Because of some of the limitations of C, we need to create our own library.c file to allow us to add, subtract, and scalar vectors. This file also includes are basic rand() function and a lerp function. Within the library.h file we are actually defining for C what a vector is, so that we can use similar ideas for the "plants" that we used in MEL. The creation of a plant.c and plant.h file allows use to consolidate all of our procedures into a single file that can then be sourced in the main script for building the executable. Once again in the plant.h file we are defining what we want every variable to be, i.e. float, int. vector. Essentially we are creating a database to refer to. Normals all pointing in one direction. Above are the 3 main files that are utilized to generate a plant model. 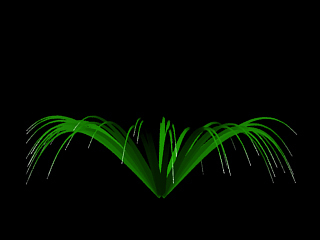 The palmetto.c file is the helper app that is randomly generating leaves from one specific origin, in this case 0,0,0. 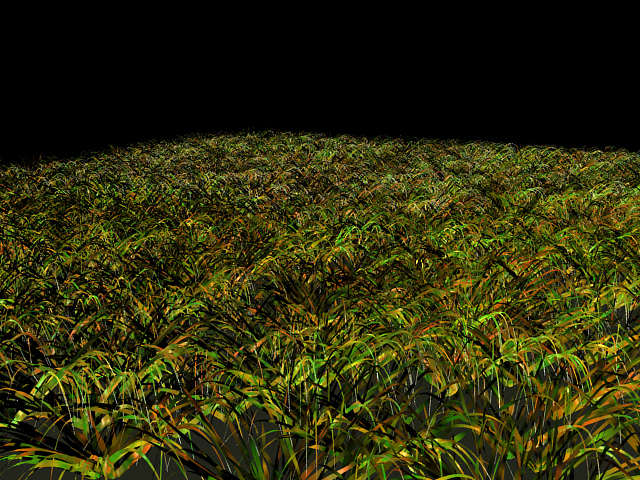 The palmetto.tcl file is bringing together the information that is being created from the attributes in Maya. the palmetto.mel script is creating the boundary cube, naming it, and creating a number of attributes that the Maya user can then adjust to whatever numbers suit them. All of this information is generated by the helper app and then returned to the render for the final image. the images above show one of the numerous things you can do with the helper app. 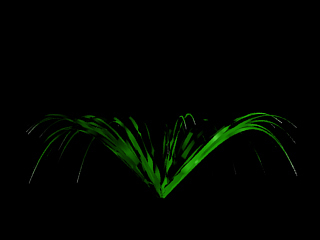 In the first image all of the normal information for the leaves are set by default to point in one direction, but with the use of the helper app I was able to randomize the direction of the leaf segments which created a "twist" in the leaf giving it a more "realistic" look. set data "\"$leafCount $leafCV $leafBase $leafTip $leafRGBx $leafRGBy $leafRGBz $leafx $leafy $leafDroop\""
set bounds "\[-1 1 0 2 -1 1\]"
return "Procedural \"RunProgram\" \[$path $data\] $bounds"
By encapsulating the MEL script into a for loop and giving it a specific number of boxes to generate. We can set up the MEL script to randomly place any number of boxes within a defined area. Added in the random color within the helper app, we are able to get some interesting images. To take this to even another level. It would be interesting to get an animation of a wind force moving the leaves in specified way. One way to do this is by using color point within MEL to generate animation with a moving color texture map. I am hoping that I get an opportunity to explore this idea in the near future. At this point we switched gears and started creating a script that would allow us to generate "plants".